Tomi is operating. Note the hight tech tent support. Here are two pictures of the new bow and anchor arrangement. Riding on the new anchor bridle. When trying to free the anchor from the coral in preparation for departure from Marion Reef, the entire bow pulpit broke off. The expeditioners made some temporary repairs. Bow pulpit. Broken clean off. This used to hold our anchor (and the boat). The new arrangement. Not pretty, but it will have to do. Extreme WX conditions made the team anchor at Marion Reef. Winds of 40 kts + (75+ km/h) and waves of 12 to 16 feet (3.5-5m) high outside the reef makes it impossible to run on the original schedule. 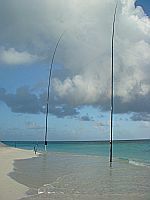 While waiting at Marion Reef the team tested the equipment (and made a number of MM QSO-s). They found that the K3 got damaged in transport. With great on-line support from Wayne (N6KR) of Elecraft, they were able to fix the radio. Airlie Beach, Queensland, Australia.Sunday, March 15. Preparations are under way for the boat trip to Mellish. We are currently provisioning and loading fuel. Lots of fuel. We intend to depart from Airlie Beach Tuesday morning. The weather forecast is fair (15 to 20 kts). Adding up all the fuel. The orange bladder tanks hold the extra fuel needed to reach Mellish (and return). Almost fully loaded. Almost ready to go. Our transport to Mellish Reef is the motor vessell PEDRO (formerly MV VARZIN), which has a fuel capacity of 5000 liters. That gives it a range of 500 nautical miles. In order to make the distance of 900 nautical miles to Mellish Reef and back, we are adding bladder tanks that will hold the additional 4000 liters of fuel required. We are filling every nook and cranny with fuel. It will be tight! The heart of our unique water-based antenna system is the home brew, water-tight 1 kW antenna coupler. The coupler allows us to use a single antenna structure for all bands and it automatically compensates for the changes caused by the rising and falling tides. This, and an appropriate set of supports, is key to being able to erect the antennas in the water. 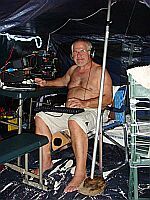 The new antenna system was tested at the AA7JV QTH in Florida.